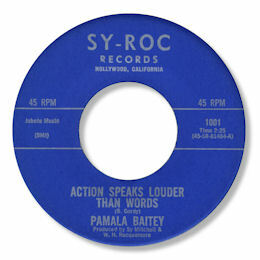 Aside from the Northern soul of "Talking Eyes" West Coast singer Pamela (or "Pamala") Baitey (or Beatty) only has this other 45 to her name (names) that I'm aware of - but it is a peach all right. Actions Speak Louder Than Words is a wonderfully memorable beat ballad - the hookline sticks in my mind like glue. I love the superb organ/piano combination behind her but as always when the accompaniment is stripped bare of any horns or strings the emphasis is placed almost totally on the singer. And Pamela's voice is strong enough and her sense of timing acute enough to really get the song over. Lovely.